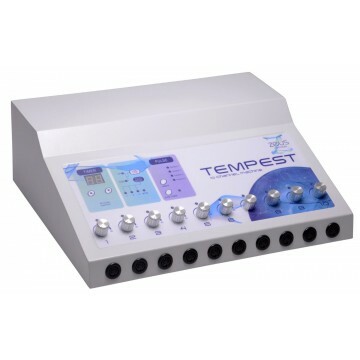 The Zeus Electrosex Tempest 10 Channel Electro Machine. This electrosex machine kit includes all that is needed for electro play for the E-stim connoisseur. The Zeus Tempest has 10 isolated leads, capable of electro stimulating up to 20 different points of the body. Four electro stimulation pattern programs plas an automatic mode that switches through each mode, all at 3 speeds. Increase your electro play possibilies by experience the rest of the Zues electrosex pins, electrodes and accesories, all of which are compatible with the Zeus Tempest. Easy to use controls and an LED display to show you your current settings and a timer. Comes complete with electrode bands, pands and leads. Electrosex uses small currents of electricity to stimulate your nerves and muscles, making you vibrate from the inside out! Imperial 15.25 inches in length, 12.5 inches in width, 5 inches in height.